It's true - winter this time around has made its presence felt. Gone are the walks to nearby parks, moving around with a bike, being out in the fresh air. Instead, nights by the hearth (or, whatever source of heat for that matter) are much preferred and cosy evenings are the name of the game... Inevitably, we all gather in the kitchen while cooking. The heat of the stoves or the oven fix our primary need for warmth, but also the expectation from whatever is bubbling in front of us lets us know that there is a reward coming along... What a nice feeling and what a great way to gather everyone around! Get a an enormous pot. Over medium heat, brown the cubes in a tiny bit of oil, preferrably in batches (or water will start flowing out of the meat). Once the cubes are brown from all sides, set aside. Fry the bacon with the onions in a little oil, set aside. Next come the peppers - be careful not to brown them too much, they will require constant stirring. Bring everything back to the pot, add the sauce, the boiling water, the condiments. Leave to bubble away until it is reduced by 1/4, about 40 minutes. The stew can be served over rice, pasta, or (as I do) on its own! Warm comfort food! Perfect for winter weather. Thanks :). Comfort food indeed. I love the flavor of smoked paprika! I make goulash frequently, but I have never made it as a stew, thanks for sharing this. Please give it a try - it's delicious! me too - thanks Carole! Seeing that the temperature is ready to drop below zero this coming week (noooo, when will spring arrive?? 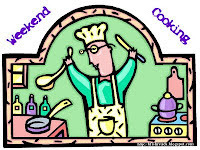 ), I'm seriously considering to follow your example and cook warming comfort food! Goulash sounds wonderful, I love paprika in stews and soups alike! Really, it's getting too much this time around! This looks like a good one for the slow cooker. true - and even easier!